Food recalls have been occurring at a startling clip in recent weeks, with Goldfish and McDonald's and Trader Joe's salads hit with food-born illness outbreaks. 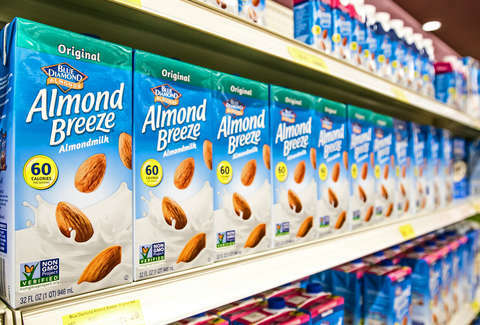 Now, almond milk is getting swept up in the mix, albeit for much different reasons: Almond Breeze, a major purveyor of the popular dairy milk alternative, has announced a recall of 150,000 half-gallon cartons of its refrigerated vanilla almond milk, over fears that it might contain actual milk from a cow. "People who have an allergy or severe sensitivity to milk run the risk of serious or life-threatening allergic reaction if they consume these products," the agency wrote in an announcement. The non-almond milk recalled applies to quantities with a use-by date of September 2, 2018. So far only one allergic reaction has been reported, and no hospitalization was required. States affected by the milk ruse are Alabama, Arkansas, Connecticut, Florida, Georgia, Iowa, Illinois, Indiana, Kentucky, Louisiana, Maryland, Maine, Michigan, Minnesota, Missouri, Mississippi, North Carolina, Nebraska, New Jersey, New York, Ohio, Oklahoma, Pennsylvania, South Carolina, Tennessee, Texas, Virginia, and Wisconsin. The incident comes as more of a shock considering declining milk consumption in the US in favor of alternatives. Quartz reports that traditional milk sales slumped 17% in 2016 alone. On the contrary, consumption of almond milk soared in the previous year, with sales climbing up 40% from 2013 and 2014, despite some of the environmental issues tied to its production, such as overuse of water. In any case, it looks like milk can sometimes play tricks, so it's definitely best to drink wisely.